I wouldn’t have been able to run that race without Miyuki unconditional Support especially with last minute sting ! Thank You , Sweet Heart ! IZU Trail Journey 2017 – DIY ! * Have completed at least one trail running race that is 30 km or longer during the period between June 1, 2015 up until race registration date. When my Entry confirmation hit my mail box it was time to confirm / pay JPY 19,500 and start talking logistics . Until one Owner after a deep thought said that providing a Room without Meals within walking distance from the start could be doable . All good . Bingo ! At 9 pm dark and cold , walking is barely an option . Or take Race shuttle for , again , ¥ 1500 . Zero Alcohol for a week prior Race . 2. Mobile phone (you must be able to make/receive calls in Japan with this mobile phone). Please input the race’s emergency number. Make sure your phone is fully charged before the race. 3. Personal cup for hot/cold drinks at aid stations (minimum 150cc size). No glass bottles allowed. 5. 2 lights (make sure they work) with replacement batteries for both lights. The jacket must be waterproof and be made of a breathable membrane (a water resistance level of at least 10,000mm/cm3 is recommended). All seams must be seam-sealed and the jacket must be able to protect you from harsh weather conditions up in the mountains. Anything not waterproof or non-breathable will be disallowed. 12. Warm clothing – Top: a combination of 3 layers (base layer, mid-layer, and outer layer) that provide warmth. Cotton is not acceptable. Down or fleece is strongly recommended. Rain jackets are acceptable as a outer layer. Bottom: running pants, leggings, or tights that completely cover your legs down to the ankles or a combination of leggings, tights, and long socks are allowed. Racer bibs will be given to you after the gear check. The IC chip is attached to the race bib. 19. Small light to put on your backpack at night. (Reflectors/reflective tape that can’t be turned on as well as handheld flashlights that can’t be attached to your backpacks are not acceptable).
. 2 lights : made sure they workwith replacement batteries for both lights.
. Small light to put on your backpack at night. 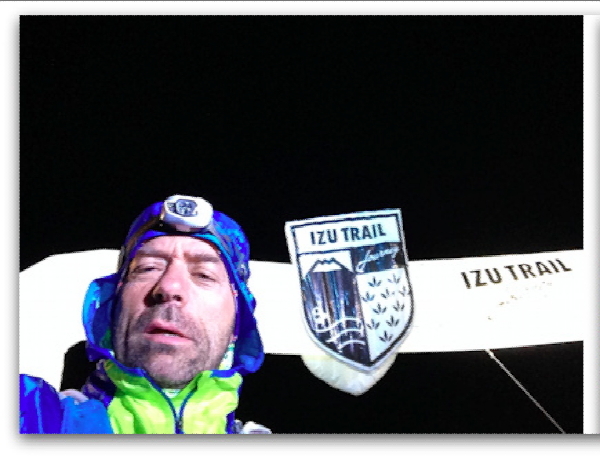 I was then given 2 racer bibs, IC chip and 2 free food coupons .
. Small light on backpack at night. Walked to Starting line , monitoring walking time needed to reach it . Kept exploring . It’s a Dead fishing Village . And bread and potato salad for morning . I had my coffee , started getting ready , dressed up , packed while having food from the supermarket . I moved to corral with 10 mn left before Start . A lady was denied racing as she arrived from toilets after Sweepers left ! Clearly for a UTMB qualifier ; not enough Toilets nor Messages in English … ooopppps ! At 6 am It was chilly but not extremely Cold .. There are four cut-off times for the race. The finish line is located at Izu Shuzenji, Izu City. You must meet all of the above cut-off times and make it cross the finish line by 20:00, Dec 10. The overall time limit is 14 hours. Will most probably never run it again .